UEFA: Who gets the 2019 club finals? UEFA welcomed expressions of interest by 15 member associations, who hope to get one or more of the 2019 cup finals. As of yet these aren’t official bids, those will be submitted by June 5. In September UEFA’s Executive Committee will vote on all accepted and approved bids. The least competitive race is that between Baku and Madrid. The Azerbaijani capital already has a modern stadium which recently hosted the first European Games and will be the host of Euro 2020, while Madrid lost out on Euro hosting rights. This might give Spanish bidders the needed edge on Baku, especially with UEFA’s tendency to award finals to brand new stadiums. Both stadia well exceed minimum capacity requirement of 60,000. Before the 2019 final is awarded, the 2017 final will be held in Cardiff, while in 2018 Champions League winners will be decided at Kyiv’s Olympic Stadium. Here the competition becomes much, much more fierce. Six national associations consider bidding. 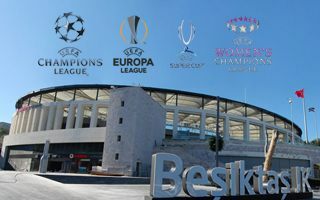 The only brand new stadium competing is Vodafone Arena in Istanbul, though Sevilla’s Estadio Ramon Sanchez Pizjuan will by 2019 see the end of its complete revamp as well. Baku wants a taste of this cup final as well, this time with regional rivals from Tbilisi, who recently hosted the Super Cup. The most experienced (or aged, if you will) contender is Hampden Park, while Germany needs to decide by June whether to confirm Frankfurt or Stuttgart as their candidate, because each association can list only one venue. This year’s final of Europa League will be played at Friends Arena. Next year it’s Lyon’s turn. Who will follow them in 2019? By far the most diverse list of possible candidates has been presented for the biggest female game. It might be held at venues as modest as Lithuania’s temporary national stadium or Getafe’s Coliseum Alfonso Perez, while at the same time much larger Astana Arena and Hampden Park could also compete. Two medium-sized and centrally-located stadia i Budapest and Prague complete the list. For reference, this year’s Women’s CL final will be played at Cardiff City Stadium and in 2018 Kyiv’s Valery Lobanovskyi Stadium takes over. Clash between CL and EL winners is a game that only recently opened up for bidding. Officially candidates don’t need to have large stadiums, with the requirement set below 20,000. This is aimed at offering a major club game to smaller associations with fewer modern stadia. Well, the list of potential candidates isn’t quite in line with this principle. Of course, you might point out to the new/rebuilt Groupama Arena, Windsor Park, Sammy Ofer Stadium or Arena Kombetare, but much larger competitors from Istanbul, Glasgow and Warsaw/Gdansk are also being considered. The list is completed by last year’s Euro host Toulouse and Astana Arena in Kazakhstan. The 2017 Super Cup game is scheduled for August 8 in Skopje, Macedonia. In 2018 the Super Cup moves for the first time to Estonia and the A. Le Coq Arena.